Vermont’s bed and breakfasts and B&B inns mirror the natural pleasures of the Green Mountain State and are found in country settings, near world renowned ski areas and even in the homes of working farm families. Many of Vermont’s B&Bs are set in the heart of charming villages and towns like Stowe, Arlington, Bennington, and Manchester and near excellent dining, shopping, galleries, historic attractions and sports venues. Vermont B&Bs may be homes on the National Register of Historic Places, as well as other centuries-old, romantic and stylish houses. Breakfast is sumptuous, with a daily appearance, of course, by Vermont’s very own maple syrup. For your daytime sojourn away from your B&B you can ski, snowboard, hike, swim, take photographs or just take it easy. But you can also have a sweet time at Ben and Jerry’s Ice Cream factory in Waterbury, sit by or sail on Lake Champlain in Burlington, or visit the vineyards (yes vineyards!) on the Champlain Islands. 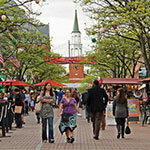 And don’t forget to search Vermont’s finely made crafts and food. 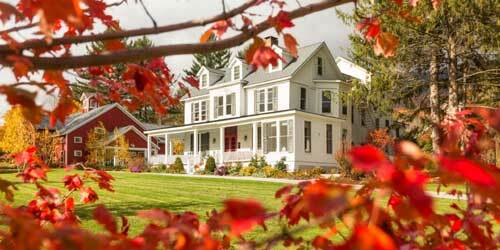 Your stay at a Vermont bed and breakfast starts right here. 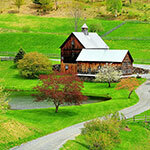 Special memories are made on a farm vacation! 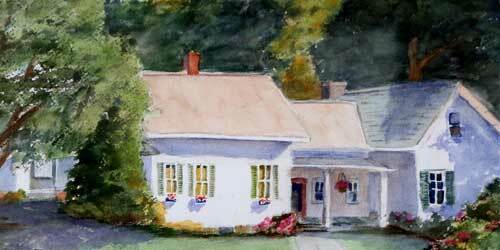 Guests have been coming to our celebrated B&B for more than a quarter century, Cozy lodgings, common areas and rocking chairs to settle into and relax plus great home style cooking and hospitality make our 150-year old farm home one of the premier destinations in central Vermont. There are seven guest bedrooms and four shared baths and free WiFi throughout. Your room includes breakfast and dinner served with Vermont charm (and maple syrup) at the family table. Visit our barn, meet our dairy cows and kittens, swim or fish in the White River, hike or snowshoe in the woods whose trails start right at our front door. 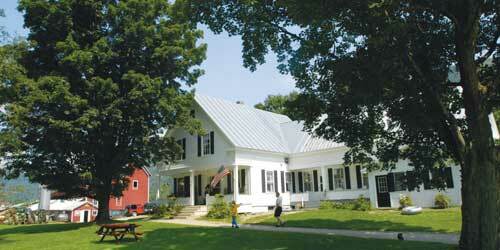 Liberty Hill Farm B&B was recently named Vermont Innkeeper of the Year by Yankee Magazine! Hobble Inn, a bed-and-breakfast on aptly named Pleasant Street in the northern Vermont town of Stowe, hits a trifecta of good things for your vacation. First, you will feel the genuine hospitality of innkeeper Mary Skelton, who restored this family place with love and who opens it generously to visitors. Next, the B&B is in a quiet neighborhood, so you can rest with ease in its comfortable guest rooms, sunroom or yard, or, alternately, dive in to the many local attractions: skiing, hiking, biking, fishing, zip lines, shopping, and more. Ms. Skelton sends you out for the day with a hearty breakfast to fuel you. Room choices include the whole home of four bedrooms and two bathrooms, sleeping 7 people, or two individual bedrooms. There’s handicap accessible bathroom. This charming lodging in the central lakes district is one of only six authentic Vermont country inns functioning today that was originally built as an Inn and still operating year round. 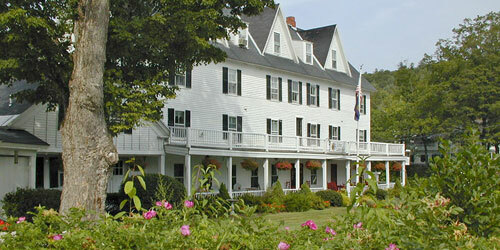 The original inn was rebuilt in 1840 as a Victorian summer hotel and features 23 rooms, some with private Jacuzzi and fireplace, a family suite, and 7 condos. Most rates include full breakfast. Relax in the hot tub or outdoor pool, play tennis, paddle your own canoe or rowboat on Echo Lake, fish on the Black River or simply set a spell on the front porch with your favorite book or beverage. You’re just 5 minutes from Okemo and there’s skiing, sleigh rides, hiking, biking and horseback riding nearby.